What Makes a Successful Promotion? “Is my promotion successful?” is a question that we often hear at Woobox. It’s a question harder to answer than one might think, as the success of a campaign ultimately comes down to expectations. As we’re unable to control something quite so subjective, we like focusing on how the contest was, or is, being run. Running a social promotion is one of the best ways to attract a targeted list of leads for your business. That’s because social promotions are fun, and people find them easy to understand and easy to engage with. If setup correctly, contests also have a natural element of vitality built into them. Meaning people are rewarded for sharing, and anyone else they share with is also rewarded for sharing. This guide will walk you through how to increase your chances of success with a social contest so that you can attract and convert more targeted leads. One of the most important parts of every promotion is the entry page. The entry page is where people will come to learn about your promotion and become engaged in participating. This page also generally includes an entry form that becomes the main hurdle for your entrants. So keep the form as clear and concise as possible. It’s also a fantastic idea to design the entry page using a color scheme and branding that matches your website, blog, and social media pages. This creates continuity and familiarity so people are more comfortable and feel immersed in your promotion. It should also be clear when the contest will be ending. Many successful contests will do this by adding a countdown clock (feature coming soon!). This helps to create a sense of urgency for entrants that still might be undecided about entering. Tip: Your prize should always be closely related to your product or service. This will ensure that you only attract people who are genuinely interested in your business, brand, or product. As opposed to using a generic prize that will attract more broad or unrelated entrants. If you are having a hard time thinking of enticing prize ideas, a great place to start is a gift card or a themed prize pack combining a number of your products. Prize packs and gift cards are great catch-alls for entrants interested in your brand. Where you host a promotion can be almost as important as the promotion itself. That’s because a big part of creating a successful promotion is considering your target audience and where and how they will be able to enter. A popular option is running a contest on both a Facebook page and on a company website. Both can display the same contest, collect entries, and draw a single winner while giving maximum exposure for the campaign. Running social contests directly on Facebook also has the added benefit of keeping Facebook users within Facebook when running Facebook Ads. This has been shown to improve conversion rates and overall contest participation. Preparing and hosting a promotion page is the first step. But adding features to enhance engagement can be what separates lackluster promotions from ones that really shine. Providing a variety of ways to enter and become involved is a sure way to increase the virality of your promotion, and overall participation. For bonus entries, a different number of entries can be awarded depending on the action taken. For example, you could reward a person 1 extra entry for a Twitter share, but 3 extra entries for gaining a referral entry in your promotion. You can also set the timeframe for when people can re-enter in the promotion. This can be set in once per day, as well as in our instant win application the amount of time is fully customizable. Allowing people to enter more than once is a great way to build up an active following around your contest from return participants. Promotions using popups, when correctly implemented into a marketing campaign, can get even more participation compared with a lone single entry form. New to Woobox is the ability to now have your promotion appear as a popup on your blog or website! This allows for a more direct approach to showcasing your offer. 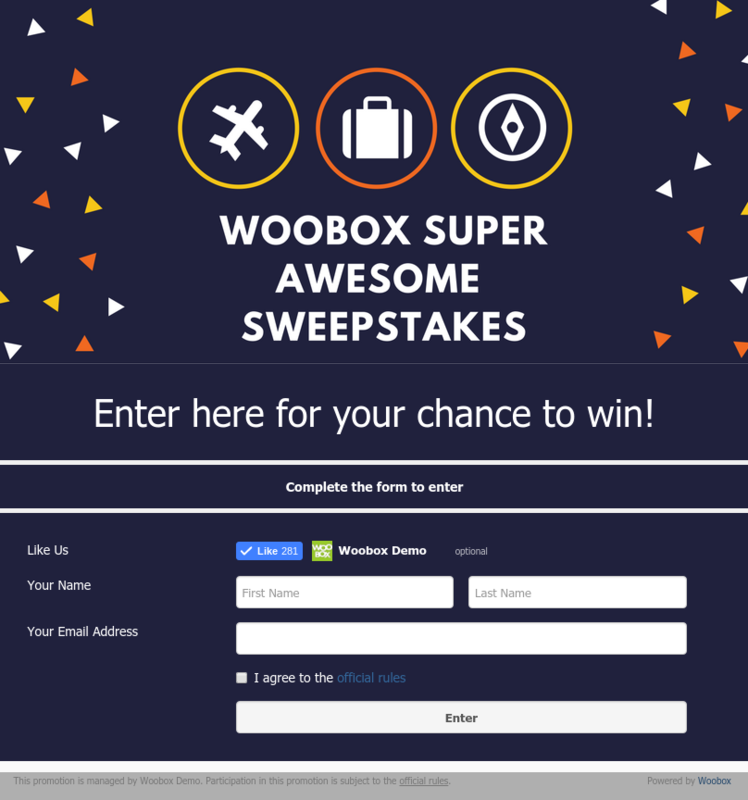 Your popup will have all the features of your promotion, compacted in a mobile friendly popup. There are a lot of components that make up a successful promotion. Each plays its own unique role but combined they can help to create a successful promotion. Begin with a plan of action that takes into account all of these options, combined with a subsequent lead nurturing strategy for turning new leads into sales. Woobox © 2017. All rights reserved.